FROM SOMOR TO NOVA SOMOR: YOUNGSTERS WITH A 100 YEARS OF HISTORY! Being born with decades of history behind us is really fortunate: it provides solid roots! NOVA SOMOR srl was not founded in order to work on recent discoveries in the field of solar energy, but to modernise technology and technical solutions and to identify new applications for inventions which have been available for many years. The company slots into the groove of a 100 years of Italian inventions in the field of low-temperature thermodynamics. This is why we have chosen a logo with a sober and old-style graphic, to emphasise the importance of these stories. In 1916 Mario Dornig wrote about the potential application of solar energy to low-temperature thermodynamic machines. 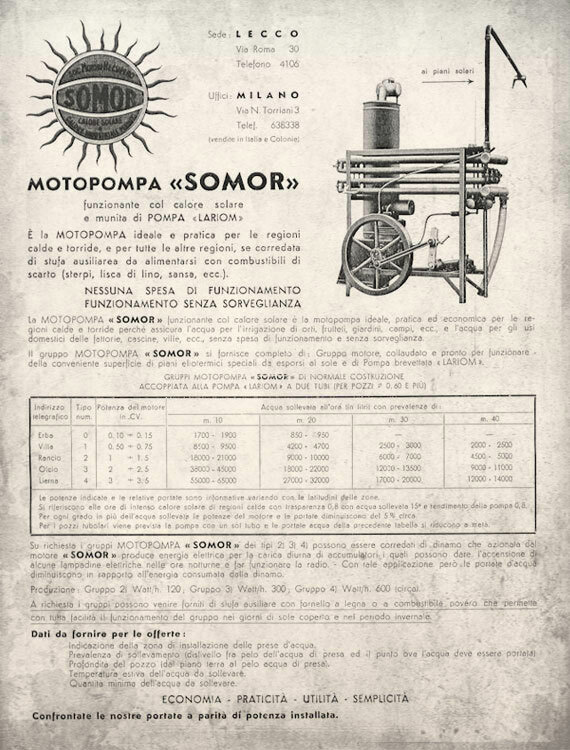 In 1922, two engineers from Bologna, Biacchi and Romagnoli, built a first solar motor running on sulphur dioxide. In 1934 Professor Luigi D’Amelio won an important prize of 10,000 lire thanks to his design for “Exploiting natural energies in Libya for motive power”. But the one who first succeeded in patenting and marketing an efficient solar energy pump in 1935, was an ingenious engineer and craftsman native of Rovereto, who worked in installing large refrigeration systems in Libya. Daniele Gasperini invented and built the “Elio Dinamic” solar energy hydraulic pump. 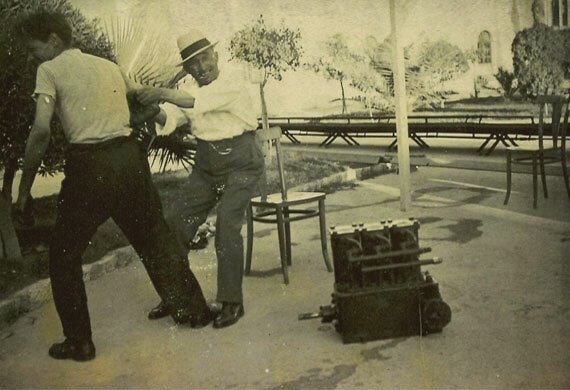 Together with his partner Andri, in 1936 he presented a prototype of his solar energy hydraulic pump for agricultural and civil use at the trade fair of Tripoli, gaining the interest of the “rural” people in the Colonies and of the local fascist authorities. The Elio Dinamic in fact perfectly embodied the dream of Italian genius working for the nation’s self-sufficiency effort. Andri (with the hat) as he tries to convince Gasperini to pose together with the just patented solar motor. It’s 1935. The war had blocked any other initiative; when it was over Daniele Gasperini dissolved his partnership with Andri and moved to Lombardy where he met engineer Ferruccio Grassi. With him, in 1949, he founded SOMOR (Engines for recovering wasted and solar heat Company) in Lecco. The company developed several models of solar pumps and managed to build about sixty prototypes. The product had excellent performances and was presented at a number of fairs and exhibitions, both in Italy and abroad. The models had different sizes and performance and were sold and successfully installed in Sardinia, Puglia, Sicily and also in Venezuela, the United States and Africa. During the first half of the 50s SOMOR was very active about new patents and promotional activities. For example, the SOMOR solar motor applied to the Lariom pump, also patented, was proposed in 1953 at the Institute of Agricultural Mechanics in Portici. In 1955 other tests were deliberately carried out under unfavourable conditions, i.e. in October with occasional clouds, at the National Centre for Agricultural Engineering of Turin. The reports that we have been able to read thanks to the availability of Daniele’s son, Gildo Gasperini, tell us of excellent results and, above all, speak of a well-tested and experienced product, not an experimental technology. In some cases the solar motor and pump were presented to politicians, in particular a pump was installed in the Olmeo estate in Sardinia, the estate next to the one of the then Agriculture Minister Antonio Segni. Contact was made with his successor Amintore Fanfani who proved to be very interested, but then did not follow this up. 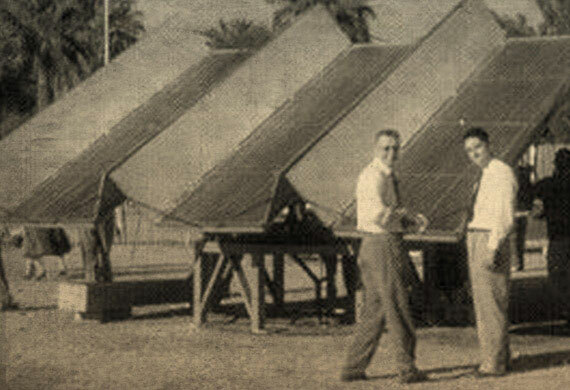 SOMOR was also a great success at the very important solar energy fair which was held in Arizona in 1955, where Mario Dornig, the pioneer of low-temperature thermodynamics, was present at the various conferences. The solar motor, with its large heliostats, stood out in the exhibition area and pumped water for the entire duration of the fair, arousing great interest and admiration. The American Machine and Foundry Company of New York commissioned the Stanford Research Institute to examine one of SOMOR’s models and results were excellent in this case also. There was even talk of selling the patent and producing 20,000 models in the US, but nothing came of it in the end. On his return to Italy, Mario Dornig, who was also proud that Grassi had been his pupil, would have liked the general public to be aware of SOMOR’s success at the solar fair in Phoenix. The rector of the Politecnico di Milano Cassinis came to his aid by writing a letter to the editor of the Corriere della Sera Missiroli, asking him to publish Dornig’s articles, but the answer was negative. It’s difficult to know exactly what happened and why, but it can be assumed that the strong feelings and political conflicts of the post-war period played an important role. All the main creators of the inventions for low-temperature thermodynamics, of which SOMOR was the offspring, had remained in Italy and had collaborated with the effort for self-sufficiency during the second half of the 30s. Instead, people like Enrico Fermi, the father of nuclear fission and other scientists, had moved to the USA. At a time when nuclear power seemed the solution to every problem related to energy, SOMOR’s solar pump probably looked like an “autarchic toy”, a technological memento of the past, which reminded everybody a little too much of an historical period to be forgotten as soon as possible. In 1960 Daniele Gasperini died of lung cancer, probably due to too much sulphur dioxide breathed in by building and experimenting with solar motors. SOMOR, which had never quite taken off, slowed its activities and in 1964 was put into liquidation. Unfortunately those pioneers had arrived on the market too early and were never understood. Having as a slogan: “Cost effectiveness, practicality, usefulness, simplicity” in the ’50s, just as consumerism was born, was not very fashionable. The fight against waste and ecology was very distant from the common views of that time and reminded everyone of all the misery of war and of poverty. The Somor pump on show in Phoenix in 1955. 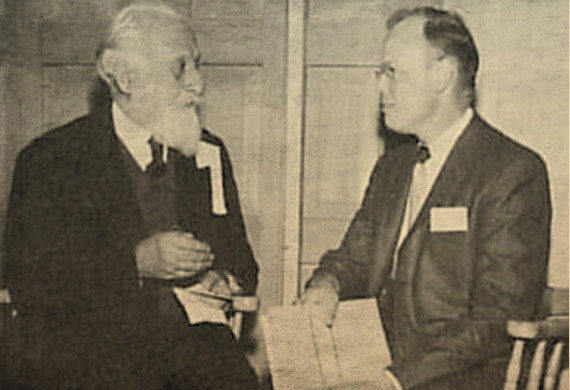 From the left, Mario Dornig with Donald L. Benedict during the Solar Energy World Congress organised by the Association of Applied Solar Energy (AFASE) in Arizona in 1955. AN OLD IDEA PROJECTED TO THE FUTURE! Times have now changed and SOMOR’s adventure can resume its journey under different auspices. As a sign of gratitude to the work of the pioneers, we requested and received the “blessing” to use their original name from the elderly heirs of the two partners Grassi and Gasperini: thus on July 15th, 2014 NOVA SOMOR was born, like a phoenix rising from its ashes to fly towards unexplored horizons. 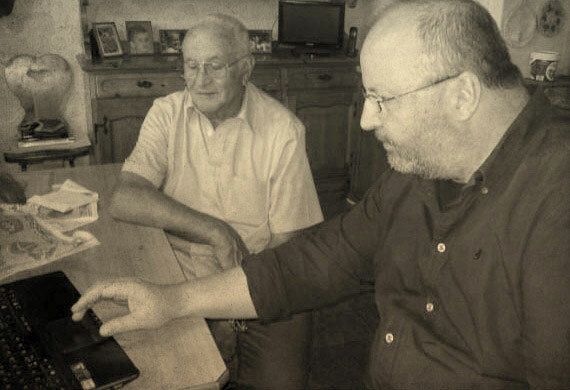 The exciting meeting with Gildo Gasperini, which took place at his home near Galbiate in late July 2014, was the seal of approval for renewing the broken thread between past and present. Potential applications of solar low-temperature thermodynamic engines are in fact countless. Where we have free heat and coolness, we can produce motive power or useful mechanical work. The original SOMOR engine in its larger version, coupled to a hydraulic Lariom pump, could raise up to 64,000 litres per hour from 10 meters deep. Pump and motor were made of cast iron and the heliostats were huge and heavy. Today we can count on lighter and more efficient materials, on more efficacious and less cumbersome heliostats and on more efficient gases that allow us to create efficient, reliable, lightweight and inexpensive products. The promoters have gathered together a large group of financing partners in order to launch the enterprise without having to resort to bank financing. A kind of Crowdfunding which allows many to participate and invest in this extraordinary project. 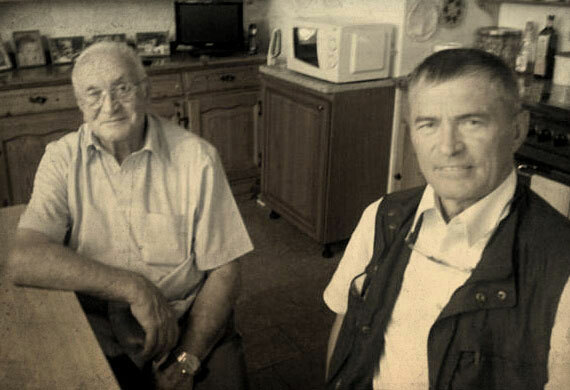 Roberto and Giordano at Gildo’s house near Galbiate in late July 2014.